The 2018 Andalusian regional election was held on Sunday, 2 December 2018, to elect the 11th Parliament of the Autonomous Community of Andalusia. All 109 seats in the Parliament were up for election. As a result of the previous election, the Spanish Socialist Workers' Party of Andalusia (PSOE–A) was able to retain power after obtaining confidence and supply support from Citizens (Cs), with such alliance enduring President Susana Díaz's defeat in the 2017 PSOE leadership election. The PSOE–Cs agreement broke up in September 2018 after Cs withdrew their support from Díaz's government, prompting Díaz to announce the Parliament's dissolution on 8 October and call a snap election for 2 December 2018. Registered turnout was the second lowest in any Andalusian regional election, only behind that of 1990. The PSOE–A remained the most voted party but suffered an unforeseen setback, dropping from 47 to 33 seats. A far-right party, Vox, gained parliamentary representation in a regional parliament in Spain for the first time since the country's return to democracy, benefiting from a collapse in the People's Party (PP) vote which saw it nearly tied in votes with Cs. For the first time in the electoral history of Andalusia, right-of-centre parties commanded an absolute majority of seats in the Parliament of Andalusia, which would allow a non-Socialist government to take power in the region after 36 years of uninterrupted PSOE rule. Subsequently, PP and Cs formed a coalition government with Vox support, electing Juan Manuel Moreno as its President. The Parliament of Andalusia was the devolved, unicameral legislature of the autonomous community of Andalusia, having legislative power in regional matters as defined by the Spanish Constitution and the Andalusian Statute of Autonomy, as well as the ability to vote confidence in or withdraw it from a President of the Regional Government. Voting for the Parliament was on the basis of universal suffrage, which comprised all nationals over eighteen, registered in Andalusia and in full enjoyment of their political rights. Additionally, Andalusians abroad were required to apply for voting before being permitted to vote, a system known as "begged" or expat vote (Spanish: Voto rogado). The 109 members of the Parliament of Andalusia were elected using the D'Hondt method and a closed list proportional representation, with a threshold of 3 percent of valid votes—which included blank ballots—being applied in each constituency. Parties not reaching the threshold were not taken into consideration for seat distribution. Additionally, the use of the D'Hondt method might result in an effective threshold over three percent, depending on the district magnitude. Seats were allocated to constituencies, corresponding to the provinces of Almería, Cádiz, Córdoba, Granada, Huelva, Jaén, Málaga and Seville. Each constituency was entitled to an initial minimum of eight seats, with the remaining 45 allocated among the constituencies in proportion to their populations on the condition that the number of seats in each province did not exceed two times that of any other. The electoral law provided that parties, federations, coalitions and groupings of electors were allowed to present lists of candidates. However, groupings of electors were required to secure the signature of at least 1 percent of the electors registered in the constituency for which they sought election. Electors were barred from signing for more than one list of candidates. Concurrently, parties and federations intending to enter in coalition to take part jointly at an election were required to inform the relevant Electoral Commission within ten days of the election being called. The term of the Parliament of Andalusia expired four years after the date of its previous election, unless it was dissolved earlier. The election Decree was required to be issued no later than the twenty-fifth day prior to the date of expiry of parliament and published on the following day in the Official Gazette of the Junta of Andalusia, with election day taking place on the fifty-fourth day from publication barring any date within from 1 July to 31 August. The previous election was held on 22 March 2015, which meant that the legislature's term would have expired on 22 March 2019. The election Decree was required to be published no later than 26 February 2019, with the election taking place on the fifty-fourth day from publication, setting the latest possible election date for the Parliament on Sunday, 21 April 2019. The President of the Regional Government had the prerogative to dissolve the Parliament of Andalusia and call a snap election, provided that no motion of no confidence was in process and that dissolution did not occur before one year had elapsed since the previous one. In the event of an investiture process failing to elect a regional President within a two-month period from the first ballot, the Parliament was to be automatically dissolved and a fresh election called. Throughout the first half of 2018, it settled among opposition parties the idea that Díaz would call a snap election by October–November 2018, several months ahead of schedule. On 3 July, ABC hypothesized on the actual chances of an early election taking place, dubbing it as a real possibility after considering that Díaz would seek to capitalize on the PSOE's growing popularity in opinion polls, hoping to benefit from the disarray within the People's Party ranks—resulting from its national leadership contest—and Citizens' inability to react after the motion of no confidence which ousted Mariano Rajoy's government from power. During the summer of 2018, it transpired that Susana Díaz was considering to call an autumn election for 28 October. In early September it was commented that the date would be delayed until either 18 or 25 November, After Cs officially withdrew its confidence and supply support from the government on 7 September, leaving the PSOE in minority, 2 or 16 December became the more likely dates for the election to be held. On 8 October, Susana Díaz announced the Parliament's dissolution and confirmed 2 December as the regional election date. The Parliament of Andalusia was officially dissolved on 9 October 2018, after the publication of the dissolution Decree in the Official Gazette of the Junta of Andalusia. The tables below show the status of the different parliamentary groups in the chamber at the time of dissolution. 8 October: The election Decree is issued with the countersign of the President after deliberation in the Government Council. 9 October: Formal dissolution of the Parliament of Andalusia and official start of ban period for the organization of events for the inauguration of public works, services or projects. 12 October: Initial constitution of Provincial and Zone Electoral Commissions. 19 October: Deadline for parties and federations intending to enter in coalition to inform the relevant Electoral Commission. 29 October: Deadline for parties, federations, coalitions and groupings of electors to present lists of candidates to the relevant Electoral Commission. 31 October: Submitted lists of candidates are provisionally published in the Official State Gazette. 3 November: Deadline for citizens entered in the Register of Absent Electors Residing Abroad and for citizens temporarily absent from Spain to apply for voting. 4 November: Deadline for parties, federations, coalitions and groupings of electors to rectify irregularities in their lists. 5 November: Official proclamation of valid submitted lists of candidates. 6 November: Proclaimed lists are published in the Official State Gazette. 16 November: Official start of electoral campaigning. 22 November: Deadline to apply for postal voting. 27 November: Official start of legal ban on electoral opinion polling publication, dissemination or reproduction and deadline for citizens entered in the Register of Absent Electors Residing Abroad to vote by mail. 28 November: Deadline for postal and temporarily absent voters to issue their votes. 30 November: Last day of official electoral campaigning and deadline for citizens entered in the Register of Absent Electors Residing Abroad to vote in a ballot box in the relevant Consular Office or Division. 1 December: Official 24-hour ban on political campaigning prior to the general election (reflection day). 2 December: Polling day (polling stations open at 9 am and close at 8 pm or once voters present in a queue at/outside the polling station at 8 pm have casted their vote). Provisional counting of votes starts immediately. 5 December: General counting of votes, including the counting of votes coming from abroad. 8 December: Deadline for the general counting of votes to be carried out by the relevant Electoral Commission. 17 December: Deadline for elected members to be proclaimed by the relevant Electoral Commission. 27 December: Deadline for both chambers of the Cortes Generales to be re-assembled (the election Decree determines this date). 26 January: Maximum deadline for definitive results to be published in the Official State Gazette. The table below lists voting intention estimates in reverse chronological order, showing the most recent first and using the dates when the survey fieldwork was done, as opposed to the date of publication. Where the fieldwork dates are unknown, the date of publication is given instead. The highest percentage figure in each polling survey is displayed with its background shaded in the leading party's colour. If a tie ensues, this is applied to the figures with the highest percentages. The "Lead" column on the right shows the percentage-point difference between the parties with the highest percentages in a given poll. When available, seat projections are also displayed below the voting estimates in a smaller font. 55 seats were required for an absolute majority in the Parliament of Andalusia. SocioMétrica/El Español[p 1] 1 Dec 2018 ? ? ? 19/22 [d] – – ? PP[p 12] 24 Nov 2018 ? ? ? 20/21 [d] – – ? PSOE[p 41] 4 Nov 2018 ? ? ? 24 [d] – – – ? ^ Alternative projection based on CIS raw data. As a result of the election, the ruling Spanish Socialist Workers' Party of Andalusia (PSOE–A) suffered a severe setback, plummeting in traditional strongholds where abstention rates skyrocketed and underperforming all opinion polls published throughout the campaign. Together with the left-wing Forward Andalusia (AA) alliance, which failed to garner the combined support of Podemos and United Left (IULV–CA) at the 2015 election, it commanded just 50 seats, five short of a majority, bringing the Socialists on the verge of losing the Regional Government after 36 years of uninterrupted rule. On the other hand, Citizens (Cs) and Vox capitalized on the People's Party (PP)'s decay, with Vox winning an outstanding—and unexpected—12 seats in the Parliament of Andalusia, making it the fifth largest party in the region (the third in the constituency of Almería, where it far exceeded the most optimistic of expectations). Together, right-of-centre parties commanded 59 out of the 109 seats in parliament. Concurrently, Vox's result signalled the first time a far-right party had won seats in a regional parliament in Spain since the country's return to democracy, following the death of longtime dictator Francisco Franco in 1975. The election was also notable for the negative electoral performances of PSOE and PP, the worst for both of them in the Spanish democratic period: the PSOE–A lost 400,000 votes, 7.4 points of the share and 14 seats compared to 2015, whereas the PP lost a further 300,000, 6 points and 7 seats over their already dwindling results. Comparisons to previous elections were even bleaker: since 2008, each party had lost around 1 million votes, 20 points and over 20 seats, with PSOE and PP at barely half of the share they had commanded in the 2004 and 2012 elections, respectively. Together, the two previously dominant parties in Andalusia garnered around 49% of the share and 54% of seats. Analysts and journalists were divided on the causes behind the PSOE's downfall. Some attributed it to discontent with the Sánchez government and his policy of seeking the parliamentary support of pro-Catalan independence parties in the Congress of Deputies after the vote of no confidence which ousted Mariano Rajoy from the central government, which would have prompted a high turnout from right-wing voters. Others, on the other hand, attributed it mostly to Susana Díaz's ruling style in Andalusia: high unemployment and rampant corruption, discontent with her government's management of the education and health services in the region, her role in the ousting of Pedro Sánchez in 2016, the subsequent PSOE's abstention to allow for Rajoy's investiture and her foiled attempt to become PSOE leader in 2017 were also said to have played a major role in the low PSOE voter turnout, together with a deep disenchantment and fatigue with the PSOE's 36-year spell in the Regional Government of Andalusia. Concurrently, the fragmentation within the centre-right to right-wing electorate was also noted as a remarkable event, as the PP's decades-long, unquestioned dominance over such spectrum came to an end. After results were known, regional and national PP leaders Juan Manuel Moreno and Pablo Casado hinted to an alliance of right-wing forces—including Vox—in order to expel the PSOE from the Regional Government. Concurrently, Cs leaders showed reticence to allying themselves with Vox, instead claiming their right to attempt to form a government of their own with PP and PSOE support "without ruling out any other options". Still incumbent President Susana Díaz urged for an alliance of democratic forces to form around her party in order to "build a firewall against the extreme right", but her chances of retaining power were regarded as slim. The PSOE leadership—headed by Prime Minister Pedro Sánchez, Díaz's long-time party rival—was not expected to support Díaz's continuity at the helm of the party in Andalusia if she was not able to maintain the Regional Government, while concurrently ruling out giving support to any hypothetical Cs government. Díaz ruled out a resignation as she "had won [the election]", reasserting her will to continue leading the PSOE–A and attempt forming a government with the support of any of the other parties but Vox. Pedro Sánchez's first public reaction to the results was to assert that his government "will continue to promote a regenerative and pro-EU project for Spain. The results in Andalusia reinforce our commitment to defend the Constitution and democracy against fear". On 3 December, the day after the election, thousands gathered throughout the streets of several Andalusian capitals to protest "against fascist policies", after Vox's entry into parliament and its prospective influence in a new Andalusian government. Within a few days from the election, both PP and Cs candidates, Juan Manuel Moreno and Juan Marín clashed on the issue of who should lead the Regional Government. The PP warned Marín that failing to support Moreno would mean a new regional election, anticipating that it would lead to a massive mobilization of PSOE–A voters who had abstained. The Cs leadership showed a willingness to enter negotiations with PP if it was to elect Marín as President, but the party was weary of having to rely on the support of far-right Vox and instead kept their offer for an—unlikely—support or abstention from PSOE. The possibility that Vox could have an influence in any future government divided Podemos: the national leadership did not rule out easening a Cs government with PSOE support, whereas regional leader Teresa Rodríguez voiced her explicit opposition to such scenario. Throughout December 2018, PP and Cs started negotiations for a prospective centre-right coalition government between the two parties, which would depend on Vox's external support. Cs ultimately agreed to support Moreno as regional President in exchange for 50% of the regional ministries and the leadership of the Parliament of Andalusia, which on 27 December resulted in Cs's Marta Bosquet becoming only the second non-PSOE President of the Parliament of Andalusia. While Vox supported Bosquet, the party announced such a support did not imply they would automatically support a PP–Cs government without them being called into a formal negotiation with the two parties, which Cs refused to concede. Both PP and Cs had been negotiating a formal agreement made of 90 core proposals, some of which—such as their promise to fully apply gender equality laws or the approval of various measures aimed at violence against women-prevention—went against Vox's own electoral manifesto. Cs warned that such a document was not negotiable and that it would constitute the basis for any prospective agreement with Vox, whereas PP's Pablo Casado showed a willingness to make some concessions to Vox in exchange for support and agreed to bring the far-right party into the negotiations. On 8 January 2019, Vox published a list of 19 demands in exchange for supporting a centre-right government, including cuts in the regional self-government, a repeal of regional legislation affording special protection to women and LGTBI groups, and the creation of new laws to protect bullfighting, hunting and "popular culture and traditions", as well as the deportation of 52,000 undocumented migrants and the elimination of public subsidies for "supremacist feminism" and for "Islamic associations". Both Cs and leading PP figures were reportedly shocked at the party's demands, which they saw as "unnaceptable" and "unnegotiable". Such demands, but also Casado's attempts to sympathize with Vox's stances, caused a particular outcry within the PP's most moderate ranks—which regarded Vox's positions as outrageous— but Casado's leadership sought to keep on the negotiation with Vox nonetheless and called for the critics to not intervene. This advice went unheeded as an increasing number of PP regional leaders joined in their open criticism of Vox's demands. The Government of France of Emmanuel Macron, European ally of Cs leader Albert Rivera, was reported to be closely following the government formation process in Andalusia and warned, ahead of the 2019 European Parliament election, that allying with far-right parties could not be a choice. Amid mounting criticism, it was reported throughout the afternoon of 9 January that PP and Cs, on the one hand, and PP and Vox, on the other, had reached separate agreements to elect Juan Manuel Moreno as new regional President. Vox was reported to have renounced their most controversial demands, specially those on gender equality, in order to reach an agreement. The PSOE–A initially announced that Susana Díaz would run for investiture and called for Cs to join "a democratic bloc" against the far-right, whereas Adelante Andalucía showed a willingness to support any alternative candidate to prevent a Vox-influenced government. However, after the PP–Cs and PP–Vox agreements were formally confirmed, Díaz declined to attempt investiture and announced that she would lead the opposition to the new regional government. As a result, the date for Moreno's investiture was set for 15 and 16 January. As a result of the investiture vote, Moreno was elected as new President of the Regional Government of Andalusia, being sworn in on 18 January 2019. On 21 January, Moreno unveiled the composition of his new government, formed by 6 PP regional ministers—aside from himself—and 5 Cs members, with Cs leader Juan Marín being appointed as Vice President. ^ Aggregated data for Podemos and IULV–CA in the 2015 election. ^ 14 Podemos, 1 eQuo. ^ a b c d e f g h i j k l m n o p q r s t u v w x y z aa ab ac ad ae af ag ah ai aj ak al am an ao ap aq ar as at au av aw ax ay az ba bb bc bd be bf bg bh bi bj bk bl bm bn bo bp bq br bs bt bu bv bw bx by bz ca cb cc cd ce cf cg ch ci cj ck cl cm cn Within AA. ^ a b c d e f g h i j k l Within Unidos Podemos. ^ "Sondeos privados que dan a Vox 7 escaños alteran los cálculos electorales en Andalucía". El Español (in Spanish). 1 December 2018. ^ "Cosecha de aceituna (30N): fin del triple empate. La castellana sumaría 6 toneladas". electomania.es (in Spanish). 30 November 2018. ^ "Sondeo elecciones andaluzas: VOX dinamita el escenario político". ABC Sevilla (in Spanish). 2 December 2018. ^ "Cosecha de la aceituna (29N): la hojiblanca pierde la cota de 40 Tn, mientras la castellana sube a cinco". electomania.es (in Spanish). 29 November 2018. ^ "Cosecha de la aceituna (28N): día tranquilo con las moriscas a la baja". electomania.es (in Spanish). 28 November 2018. ^ "La encuesta interna que "firmaría" Susana Díaz para el 2-D: 33% de voto y 43 escaños". Libertad Digital (in Spanish). 27 November 2018. ^ "Tracking interno de Hojiblanca: la Castellana quita producción a la Manzanilla". electomania.es (in Spanish). 27 November 2018. ^ "La cosecha de la aceituna (27N): el debate rebaja las expectativas de la Manzanilla". electomania.es (in Spanish). 27 November 2018. ^ "Encuestas electorales Andalucía 2018: El bloque a la derecha del PSOE sigue sin opciones de gobernar pese a la entrada de VOX en el Parlamento andaluz". ABC Sevilla (in Spanish). 26 November 2018. ^ "Último sondeo de GAD3 antes de las elecciones del 2-D en Andalucía - ABC". GAD3 (in Spanish). 26 November 2018. ^ "ElectoPanel Andalucía (y V): todo abierto aún para la segunda plaza". electomania.es (in Spanish). 26 November 2018. ^ "Un sondeo con 4 escaños a Vox y la semana negra por el CGPJ amargan la campaña al PP". El Confidencial (in Spanish). 24 November 2018. ^ "Estimación Noviembre 2018. Andalucía. Autonómicas 2018". SyM Consulting (in Spanish). 26 November 2018. ^ "Encuesta 2-D: Susana Díaz podría gobernar a izquierda o derecha y el PP frena su caída". Marbella Confidencial (in Spanish). 26 November 2018. ^ "Encuesta electoral: El efecto VOX resta a Cs". La Razón (in Spanish). 26 November 2018. ^ "Encuesta NC Report noviembre de 2018" (PDF). La Razón (in Spanish). 26 November 2018. ^ "Susana Díaz ganará en Andalucía y Ciudadanos dobla sus apoyos a costa del Partido Popular". eldiario.es (in Spanish). 26 November 2018. ^ "Susana Díaz perdería hasta 10 escaños, el PP sería segundo y Vox entraría en el Parlamento andaluz". El Español (in Spanish). 26 November 2018. ^ "El 78% de los votantes de Vox procede de PP y Cs y sólo un 13% de PSOE y Podemos". El Español (in Spanish). 26 November 2018. ^ "Encuesta elecciones andaluzas 2 de diciembre 2018. Resultados". Top Position (in Spanish). 23 November 2018. ^ "Elecciones Andalucía 2018: el PSOE volvería a ganar con un 33% de los votos, el PP perdería siete escaños y VOX entraría en el Parlamento". laSexta (in Spanish). 26 November 2018. ^ "La escalada de Ciudadanos y la irrupción de Vox alteran el mapa político de Andalucía". El Mundo (in Spanish). 24 November 2018. ^ "Las provincias castigan al bipartidismo restando votos a PP y PSOE en favor de Ciudadanos y de Vox". El Mundo (in Spanish). 25 November 2018. ^ "El PSOE ganará en Andalucía pero necesitará de pactos para gobernar". El País (in Spanish). 25 November 2018. ^ "Vox se mueve entre 0 y 4 escaños". El País (in Spanish). 25 November 2018. ^ "Sondeo para La Voz: el PSOE apenas sufre desgaste y Cs no adelanta al PP". La Voz de Almería (in Spanish). 25 November 2018. ^ "El PSOE volvería a ganar, pero algo más lejos de la mayoría absoluta". Diario Córdoba (in Spanish). 25 November 2018. ^ "El bipartidismo andaluz se rompe y a Díaz se le complican los pactos de gobierno tras el 2D". Público (in Spanish). 18 November 2018. ^ "ElectoPanel Andalucía (IV): entrada de VOX y bajada del PP". electomania.es (in Spanish). 19 November 2018. ^ "ElectoPanel Andalucía (IV): conseguir escaño se vuelve más difícil". electomania.es (in Spanish). 20 November 2018. ^ "Encuesta: El PP resiste ante Cs, que se queda como cuarta fuerza". La Razón (in Spanish). 19 November 2018. ^ a b c d e "El PP supera a Ciudadanos en Andalucía mientras Susana Díaz aumenta su ventaja". El Español (in Spanish). 19 November 2018. ^ "Sondeo: la aspiración de PP y Ciudadanos de sacar al PSOE del poder en Andalucía estaría a entre tres y siete escaños de distancia". Antena 3 (in Spanish). 19 November 2018. ^ "Encuesta Grupo Joly: Susana Díaz ganaría las elecciones en Andalucía, pero acusa el gran ascenso de Ciudadanos". Diario de Sevilla (in Spanish). 18 November 2018. ^ "El PSOE acusa el caso ERE pero volvería a ganar con empate entre Cs, Podemos y PP". La Información (in Spanish). 18 November 2018. ^ "Encuesta electoral ABC: PP y Cs necesitan sumar entre tres y ocho escaños más para desalojar al PSOE de la Junta". ABC Sevilla (in Spanish). 18 November 2018. ^ "ElectoPanel Andalucía (III): el PSOE aumenta ligeramente su ventaja". electomania.es (in Spanish). 12 November 2018. ^ "ElectoPanel Andalucía (III): estimación de escaños". electomania.es (in Spanish). 13 November 2018. ^ "Ciudadanos es el único partido que crece en Andalucía y ya adelanta en dos puntos al PP". El Español (in Spanish). 12 November 2018. ^ "El PSOE volvería a ganar las autonómicas pero sin mayoría suficiente". Andalucía Información (in Spanish). 14 November 2018. ^ "El Gobierno cree que Andalucía ratificará el hundimiento del PP". El País (in Spanish). 4 November 2018. ^ "ElectoPanel Andalucía (II). 'Triple empate perfecto' para la segunda plaza". electomania.es (in Spanish). 5 November 2018. ^ "ElectoPanel Andalucía (II). Estimación de escaños por provincias". electomania.es (in Spanish). 6 November 2018. ^ "¿Quién va a ganar las elecciones en Andalucía?". El País (in Spanish). 2 December 2018. ^ "Preelectoral elecciones autonómicas 2018. Comunidad Autónoma de Andalucía (Estudio nº 3230. Octubre 2018)" (PDF). CIS (in Spanish). 14 November 2018. ^ "El PSOE ganará las elecciones andaluzas con más apoyos que la suma de PP y Ciudadanos". eldiario.es (in Spanish). 4 November 2018. 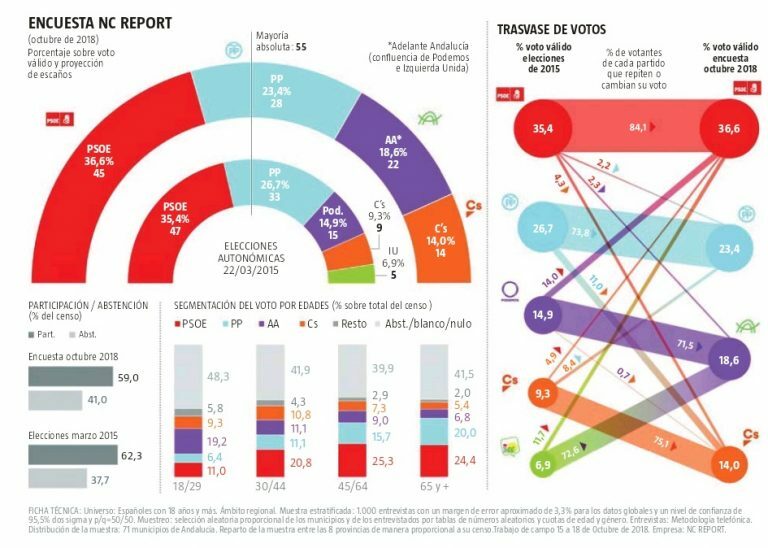 ^ "ElectoPanel Andalucía (I): el PSOE primero, y por detrás, triple empate". electomania.es (in Spanish). 29 October 2018. ^ "Díaz cae y el PP aguanta el "sorpasso"". La Razón (in Spanish). 21 October 2018. ^ "Encuesta NC Report. Octubre de 2018". La Razón (in Spanish). 21 October 2018. ^ "El PSOE se desploma pero gobernará con Cs o Adelante Andalucía y el PP se hunde". El Confidencial (in Spanish). 20 October 2018. ^ "Claves de la encuesta andaluza". El Confidencial (in Spanish). 21 October 2018. ^ "El PP se hunde en Andalucía, Ciudadanos se dispara y Díaz podrá gobernar con UP o C's". Público (in Spanish). 14 October 2018. ^ "Susana Díaz se estrella y la alianza de Juanma Moreno y Juan Marín puede ganarla". esdiario.com (in Spanish). 17 October 2018. ^ "Electopanel Andalucía: PP, Adelante Andalucía y Ciudadanos empatados, pero Susana Díaz sigue por delante". electomania.es (in Spanish). 23 September 2018. ^ "El PSOE sigue cayendo en Andalucía mientras Cs, PP y Podemos luchan por el segundo puesto". El Español (in Spanish). 17 September 2018. ^ "El PSOE dobla al PP en escaños y refuerza su liderazgo en Andalucía". Andalucía Información (in Spanish). 3 July 2018. ^ "Macrobarómetro Andalucía Junio 2018". SW Demoscopia (in Spanish). 3 July 2018. ^ "ANDALUCÍA. Elecciones autonómicas. Encuesta SW Demoscopia para Publicaciones del Sur. Junio 2018". Electograph (in Spanish). 3 July 2018. ^ "ElectoPanel Andalucía: El PSOE volvería a ganar". electomania.es (in Spanish). 16 June 2018. ^ "Estimación Mayo 2018. Andalucía. 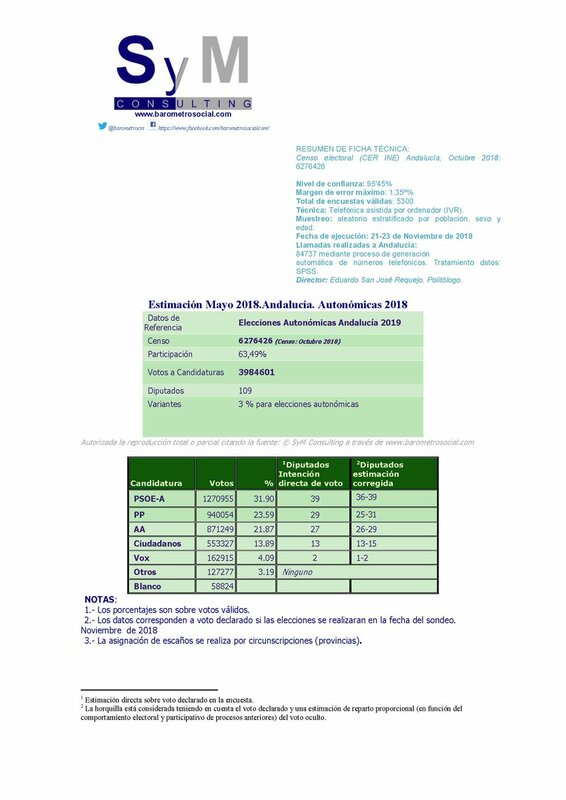 Autonómicas 2019". SyM Consulting (in Spanish). 2 June 2018. ^ "ANDALUCÍA. Elecciones autonómicas. Encuesta SyM Consulting. Mayo 2018". Electograph (in Spanish). 2 June 2018. ^ "Teresa Rodríguez supera a la marca Podemos y podría gobernar con Susana Díaz". El Independiente (in Spanish). 17 May 2018. ^ "ANDALUCÍA. Elecciones autonómicas. Encuesta U. de Granada para Podemos. Marzo 2018". Electograph (in Spanish). 17 May 2018. ^ "Ciudadanos crece también en Andalucía, pero sobre todo a costa del PSOE". El Mundo (in Spanish). 25 February 2018. ^ "ANDALUCÍA. Elecciones autonómicas. Sondeo NC Report, Febrero 2018". Electograph (in Spanish). 25 February 2018. ^ "Encuesta Deimos: El PSOE volvería a ganar las elecciones y Ciudadanos no conseguiría sobrepasar al PP". Marbella Confidencial (in Spanish). 4 March 2018. ^ "Un PSOE-A sin erosión volvería a ganar con holgura las andaluzas". El Correo de Andalucía (in Spanish). 4 March 2018. ^ "ANDALUCÍA. Elecciones autonómicas. Sondeo Deimos Estadística, Febrero 2018". Electograph (in Spanish). 3 March 2018. ^ "El PSOE volvería a ganar en Andalucía y consolidaría su hegemonía". Andalucía Información (in Spanish). 25 February 2018. ^ "Macrosondeo Andalucía 28F". SW Demoscopia (in Spanish). 25 February 2018. ^ "ANDALUCÍA. Elecciones autonómicas. Sondeo SW Demoscopia para Publicaciones del Sur, Febrero 2018". Electograph (in Spanish). 25 February 2018. ^ "El PSOE bajaría siete escaños en Andalucía mientras crecen PP y C's, según un sondeo del Observatorio de Ciudadanía y Gobernanza". eldiario.es (in Spanish). 28 February 2018. ^ "ANDALUCÍA. Elecciones autonómicas. Sondeo Observatorio de Ciudadanía y Gobernanza, Febrero 2018". Electograph (in Spanish). 28 February 2018. ^ "Estudio General de Opinión Pública de Andalucía. EGOPA Invierno de 2018" (PDF). CADPEA (in Spanish). 26 February 2018. ^ "El PSOE gana, pero PP y CS están a un escaño de alcanzar la mayoría para un cambio de gobierno". ABC (in Spanish). 28 February 2018. ^ "ANDALUCÍA. Elecciones autonómicas. Sondeo GAD3 para ABC, Enero 2018". Electograph (in Spanish). 28 February 2018. ^ "El PSOE ganaría las andaluzas y el PP acusaría el crecimiento de Ciudadanos". La Opinión de Málaga (in Spanish). 13 January 2018. ^ "El pacto entre PSOE y C's saldría reforzado si hubiera elecciones". Diario Córdoba (in Spanish). 13 January 2018. ^ "El PSOE fija su hegemonía pese al viaje de ida y vuelta de Susana Díaz a Ferraz". La Opinión de Málaga (in Spanish). 22 July 2017. ^ "El PSOE volvería a ganar, pero sigue lejos de la mayoría absoluta". Diario Córdoba (in Spanish). 22 July 2017. ^ "Díaz da el salto para liderar el PSOE mientras pierde votos en Andalucía". La Razón (in Spanish). 13 March 2017. ^ "Encuesta NC Report marzo 2017" (PDF). La Razón (in Spanish). 13 March 2017. ^ "El PSOE ganaría en Andalucía y lograría mejorar sus resultados de marzo de 2015". La Opinión de Málaga (in Spanish). 28 February 2017. ^ "El PSOE mantiene la mayoría en Andalucía mediada la legislatura". Diario Córdoba (in Spanish). 28 February 2017. ^ "El PSOE al borde de la mayoría absoluta, podría reeditar el pacto y gobernar con C's en Andalucía". Marbella Confidencial (in Spanish). 28 February 2017. ^ "La carrera hacia Ferraz le pasa factura (interna) a Susana Díaz". El Mundo (in Spanish). 27 February 2017. ^ "ANDALUCÍA, Febrero 2017. Sondeo Bevents (interno PP)". Electograph (in Spanish). 27 February 2017. ^ "El PSOE ganaría las andaluzas y podría repetir el acuerdo con C's". La Opinión de Málaga (in Spanish). 22 January 2017. ^ "El PSOE tendría que volver a pactar para conservar el Gobierno andaluz". Diario Córdoba (in Spanish). 22 January 2017. ^ "Estudio General de Opinión Pública de Andalucía. EGOPA Invierno 2017" (PDF). CADPEA (in Spanish). 18 January 2017. ^ "El apoyo a Susana Díaz no frena a Ciudadanos, que subiría 8 escaños". Marbella Confidencial (in Spanish). 28 February 2016. ^ "Estudio General de Opinión Pública de Andalucía. EGOPA Invierno 2016" (PDF). CADPEA (in Spanish). 25 February 2016. ^ "Ciudadanos rentabiliza el apoyo al PSOE y ganaría tres diputados más en el Parlamento andaluz". La Opinión de Málaga (in Spanish). 18 October 2015. ^ "Estudio sociopolítico autonómico. ANDALUCÍA, Septiembre de 2015" (PDF). Celeste-Tel (in Spanish). 19 October 2015. ^ "Estudio General de Opinión Pública de Andalucía. EGOPA Verano 2015" (PDF). CADPEA (in Spanish). 27 July 2015. ^ "Otras elecciones en Andalucía perjudicarían sobre todo al PP". El País (in Spanish). 17 May 2015. ^ "Situación política en Andalucía". El País (in Spanish). 17 May 2015. ^ "Susana Díaz será investida el jueves tras el acuerdo con Ciudadanos". El Mundo (in Spanish). 9 June 2015. Retrieved 3 July 2018. ^ "Susana Díaz se aferra a Ciudadanos como "socio privilegiado" a largo plazo". Público (in Spanish). 5 June 2017. Retrieved 3 July 2018. ^ a b "La ejecutiva de Ciudadanos aprobará romper el pacto con Susana Díaz". El Confidencial (in Spanish). 7 September 2018. Retrieved 7 September 2018. ^ a b "Díaz: "Andalucía no merece la inestabilidad política que hay en el resto de España"". El Confidencial (in Spanish). 8 October 2018. Retrieved 8 October 2018. ^ "Andalucía registra la segunda participación más baja en las autonómicas". ABC Sevilla (in Spanish). 2 December 2018. Retrieved 5 December 2018. ^ "La derecha suma para gobernar en Andalucía gracias al batacazo de PSOE-A y la irrupción de Vox". La Vanguardia (in Spanish). 2 December 2018. Retrieved 3 December 2018. ^ "Fin de una era: adiós a Susana Díaz, irrumpe Vox y la derecha suma". El Confidencial (in Spanish). 2 December 2018. Retrieved 3 December 2018. ^ "Far right wins seats in Spanish region for first time since Franco". The Guardian. 2 December 2018. Retrieved 3 December 2018. ^ a b c d "Statute of Autonomy for Andalusia of 2007". Organic Law No. 2 of 19 March 2007. Official State Gazette (in Spanish). Retrieved 16 September 2017. ^ a b c "Andalusia Electoral Law of 1986". Law No. 1 of 2 January 1986. Official Gazette of the Junta of Andalusia (in Spanish). Retrieved 16 September 2017. ^ a b c d "General Electoral System Organic Law of 1985". Organic Law No. 5 of 19 June 1985. Official State Gazette (in Spanish). Retrieved 28 December 2016. ^ a b c "Representation of the people Institutional Act". juntaelectoralcentral.es. Central Electoral Commission. Retrieved 16 June 2017. ^ "Government of the Autonomous Community of Andalusia Law of 2006". Law No. 6 of 24 October 2006. Official Gazette of the Junta of Andalusia (in Spanish). Retrieved 17 September 2017. ^ "Andalucía, próxima batalla electoral tras el seísmo Catalunya". eldiario.es (in Spanish). 22 January 2018. Retrieved 3 July 2018. ^ "Susana Díaz se prepara para elecciones en otoño". El Confidencial (in Spanish). 1 April 2018. Retrieved 3 July 2018. ^ "El adelanto electoral en Andalucía está cada día más cerca". ABC (in Spanish). 3 July 2018. Retrieved 3 July 2018. ^ "Susana Díaz sopesa el adelanto electoral para aprovechar una coyuntura favorable". La Vanguardia (in Spanish). 6 July 2018. Retrieved 8 July 2018. ^ "Los partidos preparan las elecciones para otoño". Diario de Sevilla (in Spanish). 8 July 2018. Retrieved 8 July 2018. ^ "Susana Díaz baraja el 18 o el 25 de noviembre para el adelanto de las elecciones andaluzas". ABC Sevilla (in Spanish). 1 September 2018. Retrieved 2 September 2018. ^ "El órdago de Cs a Díaz aboca al adelanto electoral en Andalucía". La Vanguardia (in Spanish). 2 September 2018. Retrieved 2 September 2018. ^ "Susana Díaz comunicará en unos días la fecha de las elecciones andaluzas". Cadena SER (in Spanish). 4 October 2018. Retrieved 4 October 2018. ^ a b c "Decreto de la Presidenta 8/2018, de 8 de octubre, de disolución del Parlamento de Andalucía y de convocatoria de elecciones" (PDF). Boletín Oficial de la Junta de Andalucía (in Spanish) (6 Extraordinary): 2–3. 9 October 2018. ISSN 2253-802X. ^ a b c "Parliament of Andalusia elections since 1982". historiaelectoral.com (in Spanish). Electoral History. Retrieved 22 March 2019. ^ "Elecciones al Parlamento de Andalucía 2018. Calendario Electoral" (PDF). juntaelectoralcentral.es (in Spanish). Central Electoral Commission. Retrieved 23 March 2019. ^ "PSOE-A proclama a Susana Díaz como candidata a la reelección en presencia de Pedro Sánchez". Europa Press (in Spanish). 19 October 2018. Retrieved 18 January 2019. ^ "Casado ratifica a Juan Manuel Moreno como candidato a las elecciones andaluzas". El País (in Spanish). 23 July 2018. Retrieved 18 January 2019. ^ "Teresa Rodríguez será la candidata de Adelante Andalucía a la Presidencia de la Junta". Diario Sur (in Spanish). 7 September 2018. Retrieved 18 January 2019. ^ "Juan Marín repetirá como candidato de Ciudadanos a la Junta de Andalucía". El País (in Spanish). 16 July 2018. Retrieved 18 January 2019. ^ "VOX se presentará a las elecciones en Andalucía". Libertad Digital (in Spanish). 17 October 2018. Retrieved 18 January 2019. ^ "VOX elige al juez de familia Francisco Serrano como candidato en Andalucía". Libertad Digital (in Spanish). 26 October 2018. Retrieved 18 January 2019. ^ "'Con Susana + Andalucía', lema de la campaña del PSOE-A que arrancará en Granada". InfoLibre (in Spanish). 16 November 2018. Retrieved 14 November 2018. ^ a b c d "Los vídeos electorales del arranque de la campaña andaluza". infolibre (in Spanish). 16 November 2018. Retrieved 20 November 2018. ^ "Morante de la Puebla cierra campaña por Vox en la furgoneta 'más española' después de abrirla a caballo". El Mundo (in Spanish). 30 November 2018. Retrieved 5 December 2018. ^ "El primer debate entre los principales candidatos a la presidencia de la Junta, este lunes en Canal Sur Televisión". Canal Sur (in Spanish). 17 November 2018. Retrieved 23 January 2019. ^ "Éxito de audiencia del debate de los candidatos en Canal Sur". Canal Sur (in Spanish). 20 November 2018. Retrieved 23 January 2019. ^ "Elecciones Andalucía 2018: El debate definitivo a cuatro, el próximo lunes en RTVE". RTVE (in Spanish). 23 November 2018. Retrieved 23 January 2019. ^ "El debate electoral a cuatro en RTVE sumó 395.000 espectadores y un 12,3% de cuota, menos que el de Canal Sur TV". Europa Press (in Spanish). 27 November 2018. Retrieved 23 January 2019. ^ "2018 Parliament of Andalusia election. Provisional results". juntadeandalucia.es (in Spanish). Junta of Andalusia. Retrieved 2 December 2018. ^ a b "Parliament of Andalusia election results, 2 December 2018" (PDF). juntadeandalucia.es (in Spanish). Electoral Commission of Andalusia. 26 December 2018. Retrieved 17 January 2019. ^ "La hecatombe del PSOE abre la puerta a un gobierno de la derecha en Andalucía". El Mundo (in Spanish). 3 December 2018. Retrieved 3 December 2018. ^ "En el cuartel general de Díaz: la noche negra en la que se hundió el PSOE andaluz". El Huffington Post (in Spanish). 3 December 2018. Retrieved 3 December 2018. ^ "El PSOE se desploma en Andalucía y la izquierda pierde la mayoría". La Voz de Galicia (in Spanish). 3 December 2018. Retrieved 3 December 2018. ^ "Vox consigue sus mejores resultados en los municipios en los que la derecha era más fuerte en 2015". eldiario.es (in Spanish). 3 December 2018. Retrieved 3 December 2018. ^ "La paradoja de Moreno Bonilla: el auge de Ciudadanos salva el peor resultado del PP". El Español (in Spanish). 3 December 2018. Retrieved 3 December 2018. ^ "Juanma Moreno hace historia y podrá ser presidente con el peor resultado del PP". El Confidencial (in Spanish). 2 December 2018. Retrieved 3 December 2018. ^ "In first for post-Franco Spain, far-right elects regional MPs". Al Jazeera. 3 December 2018. Retrieved 3 December 2018. ^ "Spain's Vox party wins seats as far-right party surges for first time since Franco". CNN. 3 December 2018. Retrieved 3 December 2018. ^ a b c "Fin de ciclo... y de Susana Díaz". El Huffington Post (in Spanish). 3 December 2018. Retrieved 3 December 2018. ^ "Evolución del voto en Andalucía: así han sido los resultados de todas las elecciones autonómicas desde 1982". eldiario.es (in Spanish). 3 December 2018. Retrieved 3 December 2018. ^ "PSOE y PP, en mínimos históricos en las elecciones andaluzas". Newtral (in Spanish). 3 December 2018. Retrieved 3 December 2018. ^ "El 'bipartidismo' PSOE-PP cae al mínimo histórico por debajo del 49% con 718.000 votos y 13 puntos menos que en 2015". Newtral (in Spanish). 3 December 2018. Retrieved 6 December 2018. ^ "Andalucía castiga la estrategia de Sánchez de gobernar apoyado en el independentismo". eldiario.es (in Spanish). 3 December 2018. Retrieved 3 December 2018. ^ ""Adiós Susanita, adiós"". Público (in Spanish). 3 December 2018. Retrieved 3 December 2018. ^ "Y la herida vuelve a supurar". El Huffington Post (in Spanish). 3 December 2018. Retrieved 3 December 2018. ^ "Nuevos escenarios tras el 2D en Andalucía y en el conjunto de España". eldiario.es (in Spanish). 3 December 2018. Retrieved 4 December 2018. ^ "Lo imposible puede llegar a suceder en España". El Mundo (in Spanish). 3 December 2018. Retrieved 3 December 2018. ^ "Cataluña mató a Rajoy. ¿Lo hará con Sánchez?". El País (in Spanish). 3 December 2018. Retrieved 3 December 2018. ^ "El PP se lanza a un pacto con Vox: "Es una grandísima oportunidad que no vamos a dejar pasar"". eldiario.es (in Spanish). 3 December 2018. Retrieved 3 December 2018. ^ "Moreno cree que "no es discutible" que el PP lidere el cambio y llama a una relación "fluida" con Vox". La Vanguardia (in Spanish). 3 December 2018. Retrieved 3 December 2018. ^ "Ciudadanos: "No va a ser fácil pero habrá un nuevo gobierno en Andalucía. Ni los de los ERE ni los de la Gürtel"". eldiario.es (in Spanish). 3 December 2018. Retrieved 3 December 2018. ^ "La ejecutiva de Cs estudia su estrategia: lanzar a Marín en un pacto con PP y PSOE". El Confidencial (in Spanish). 3 December 2018. Retrieved 3 December 2018. ^ "Cs insta al PSOE a apoyar un gobierno naranja si quiere evitar la entrada de Vox". La Vanguardia (in Spanish). 3 December 2018. Retrieved 3 December 2018. ^ "Spain stunned as far-right Vox party storms into Andalusia parliament". The Independent. 3 December 2018. Retrieved 3 December 2018. ^ "Susana Díaz "abrirá diálogo" con todas las fuerzas políticas". La Vanguardia (in Spanish). 2 December 2018. Retrieved 3 December 2018. ^ "El PSOE enseña la puerta de salida a Díaz y advierte a Cs de que no le dará la Junta". El Confidencial (in Spanish). 3 December 2018. Retrieved 3 December 2018. ^ "Ferraz no ve "sensato" darle la Junta a Ciudadanos y señala la puerta de salida a Susana Díaz". eldiario.es (in Spanish). 3 December 2018. Retrieved 3 December 2018. ^ "El PSOE empuja a Susana Díaz a la dimisión pero ésta lo rechaza y pide el apoyo de Ciudadanos". El Mundo (in Spanish). 3 December 2018. Retrieved 3 December 2018. ^ "Las razones por las que Susana Díaz se enroca y se niega a dar un paso atrás". El Confidencial (in Spanish). 3 December 2018. Retrieved 3 December 2018. ^ "Susana Díaz ignora el cambio de ciclo en Andalucía: "Si quitas a la extrema derecha, aún hay mayoría de izquierdas"". eldiario.es (in Spanish). 3 December 2018. Retrieved 3 December 2018. ^ "Sánchez recalca su "compromiso de defender la Constitución y la democracia frente al miedo"". La Vanguardia (in Spanish). 3 December 2018. Retrieved 3 December 2018. ^ "Sánchez llama a "defender la Constitución y la democracia frente al miedo"". El País (in Spanish). 3 December 2018. Retrieved 3 December 2018. ^ "Concentración en Sevilla contra Vox: "¡Viva la lucha de la clase obrera!"". eldiario.es (in Spanish). 3 December 2018. Retrieved 3 December 2018. ^ "Miles de andaluces se concentran de forma espontánea contra el fascismo". El Periódico de Catalunya (in Spanish). 3 December 2018. Retrieved 3 December 2018. ^ "Cs y PP pelean por presidir Andalucía bajo amenaza de unas segundas elecciones". El Confidencial (in Spanish). 4 December 2018. Retrieved 5 December 2018. ^ "Si PP y Cs no llegan a un acuerdo habrá nuevas elecciones en Andalucía". Público (in Spanish). 4 December 2018. Retrieved 5 December 2018. ^ "Rivera marca distancias con Vox: "Negociaremos un acuerdo con el PP, espero que el PSOE no lo bloquee"". El Español (in Spanish). 5 December 2018. Retrieved 5 December 2018. ^ "Iglesias no descarta facilitar en Andalucía un gobierno de Ciudadanos pero Teresa Rodríguez lo rechaza". El Mundo (in Spanish). 5 December 2018. Retrieved 5 December 2018. ^ "Adelante Andalucía rechaza abstenerse ante un Gobierno de Cs como lanzó Iglesias". El Confidencial (in Spanish). 5 December 2018. Retrieved 5 December 2018. ^ "Cs deja en manos del PP la negociación con Vox y tendrá la mitad de las carteras". El Confidencial (in Spanish). 11 December 2018. Retrieved 9 January 2019. ^ "Marta Bosquet (Cs), nueva presidenta del Parlamento andaluz con el apoyo de PP y Vox". El Periódico de Catalunya (in Spanish). 27 December 2018. Retrieved 9 January 2019. ^ "Vox confirma que apoya el acuerdo sobre la Mesa entre PP y Ciudadanos". El País (in Spanish). 26 December 2018. Retrieved 9 January 2019. ^ "PP-A y Cs cierran su acuerdo en Andalucía con 90 medidas tras pactar el bloque social". Europa Press (in Spanish). 25 December 2018. Retrieved 9 January 2019. ^ "No habrá foto: Rivera solo negociará con Vox cuando cierre el pacto de gobierno con el PP". El Confidencial (in Spanish). 8 January 2019. Retrieved 9 January 2019. ^ "El PP ofrece a Vox dar ayudas a hombres por violencia doméstica". El Mundo (in Spanish). 4 January 2019. Retrieved 9 January 2019. ^ "El PP y Vox se reúnen para buscar un acuerdo "que ponga fin a 36 años de socialismo en Andalucía"". Europa Press (in Spanish). 8 January 2019. Retrieved 9 January 2019. ^ "Far-right party Vox wants expulsion of 52,000 migrants in exchange for votes". El País. 9 January 2019. Retrieved 9 January 2019. ^ "Las exigencias de Vox dejan en el aire el acuerdo de gobierno entre PP y Ciudadanos para Andalucía". eldiario.es (in Spanish). 8 January 2019. Retrieved 9 January 2019. ^ "Terremoto en el PP por el documento de VOX, aunque la negociación continúa". Libertad Digital (in Spanish). 8 January 2019. Retrieved 9 January 2019. ^ "Feijóo se desmarca de los guiños de Pablo Casado sobre violencia de género ante la presión de Vox". El Mundo (in Spanish). 8 January 2019. Retrieved 9 January 2019. ^ "Las imposiciones de discurso y candidatos de Casado provocan varios incendios internos en el PP". eldiario.es (in Spanish). 8 January 2019. Retrieved 9 January 2019. ^ "Alfonso Alonso: "A Vox le falta un hervor"". eldiario.es (in Spanish). 9 January 2019. Retrieved 9 January 2019. ^ "Díaz Ayuso reprende a los críticos en el PP con las negociaciones con Vox: "Dejen trabajar a la dirección nacional"". eldiario.es (in Spanish). 9 January 2019. Retrieved 9 January 2019. ^ "PP y Vox siguen negociando pese al programa "inaceptable" de los ultras". La Vanguardia (in Spanish). 9 January 2019. Retrieved 9 January 2019. ^ "Barones del PP se desmarcan de Génova y endurecen las críticas a Vox". El Mundo (in Spanish). 9 January 2019. Retrieved 9 January 2019. ^ "Los barones del PP se revuelven contra Vox: "No nos podemos arrastrar"". El País (in Spanish). 9 January 2019. Retrieved 9 January 2019. ^ "El Elíseo advierte del peligro de Vox: "No puede haber alianzas con la ultraderecha en España"". La Vanguardia (in Spanish). 9 January 2019. Retrieved 9 January 2019. ^ "PP y Ciudadanos cierran el pacto para investir a Moreno presidente de Andalucía a la espera de Vox". eldiario.es (in Spanish). 9 January 2019. Retrieved 9 January 2019. ^ "Vox apoya el futuro Gobierno andaluz de Juanma Moreno Bonilla". El Confidencial (in Spanish). 9 January 2019. Retrieved 9 January 2019. ^ "El PP logra el apoyo de Vox sin asumir sus medidas sobre violencia de género". El Mundo (in Spanish). 9 January 2019. Retrieved 9 January 2019. ^ "El PSOE propondrá a Susana Díaz como candidata a la investidura y no contempla otra opción". RTVE (in Spanish). 9 January 2019. Retrieved 9 January 2019. ^ "Susana Díaz renuncia a presentarse a la investidura y avisa a Ferraz de que liderará la oposición en Andalucía". eldiario.es (in Spanish). 10 January 2019. Retrieved 10 January 2019. ^ "Moreno será investido presidente de Andalucía el 16 de enero". El País (in Spanish). 11 January 2019. Retrieved 11 January 2019. ^ "Moreno presenta a su gabinete y avisa: "El Gobierno es uno, sin distinción de siglas"". El Confidencial (in Spanish). 21 January 2019. Retrieved 25 January 2019.